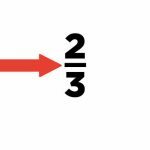 The line that separates the top and bottom numbers of a fraction is called a vinculum. Good information to have! If you ever find yourself at a party with a bunch of math nerds you can pull that randomness out of your geek holster and fire away. Have fun. On a separate note, it might be a cool name for a male. “Vin for short but I prefer you use my whole name, ‘Vinculum'”. Join me every morning for The OneManPaRTY and at the end of my broadcast I give ya a random fact to ponder and share.